Marienplatz in Munich is the beating heart of the city’s cafe culture. 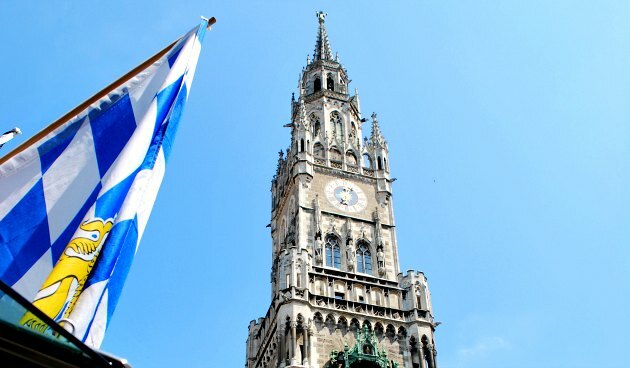 Sit at one of the outdoor cafes and you’re likely to be gazing up at the huge City Hall (Rathaus) which dominates one side of the square and houses the famous Munich Glockenspiel. Look out in the middle of Marienplatz for Marien Column (Mariensäule) which was erected in 1638 to mark the end of Swedish occupation. There is a gold statue on the top of the Virgin Mary. Another highlight in the square is the reconstruction of the old Gothic Town Hall. The original building was constructed in 1480 but was destroyed in the second world war and this replica is an impressive turreted sight on the east side of the square. 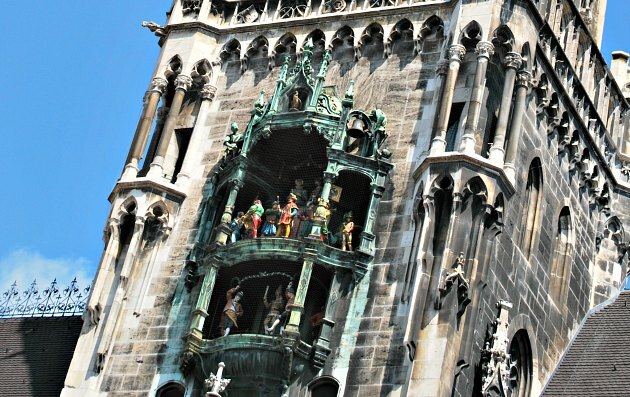 People flock to Marienplatz to see the glockenspiel which ‘performs’ every day at 11am and also in the summer at 12pm and 5pm acting out two stories with bells and characters. If you happen to be near Marienplatz at one of these times, it’s worth watching but we didn’t think it was worth making a special journey for. Also in the Marienplatz area is Munich’s huge produce market. Even if you’re not planning to buy anything, it’s a lovely place to stroll around to take in the sights and smells of cheeses, sausages, fruit and olives. There’s also a popular beer garden in the centre of the market. Marienplatz joins onto Karlsplatz in Munich city centre and is next to the Viktualienmarkt. Nearby attractions are the Frauenkirche and St Peter’s church tower. The square has its own U-bahn/S-bahn station.